In my career as a musician and a graphic designer, I’ve created countless press kits for for my own music projects, as well as for my clients. After all these years I’ve decided to share my thoughts and approach to creating a great press kit. 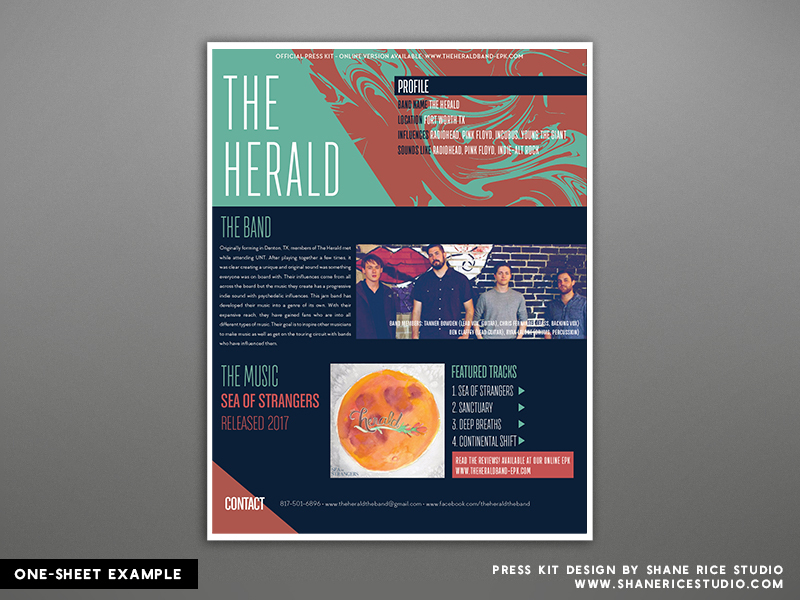 Whether you’re designing the press kit yourself, or working with a professional graphic artist (or a PR company), this guide will help you put it all together.nI’m going to focus on the content and formatting of a press kit, rather than offering a tutorial on how create the graphics. 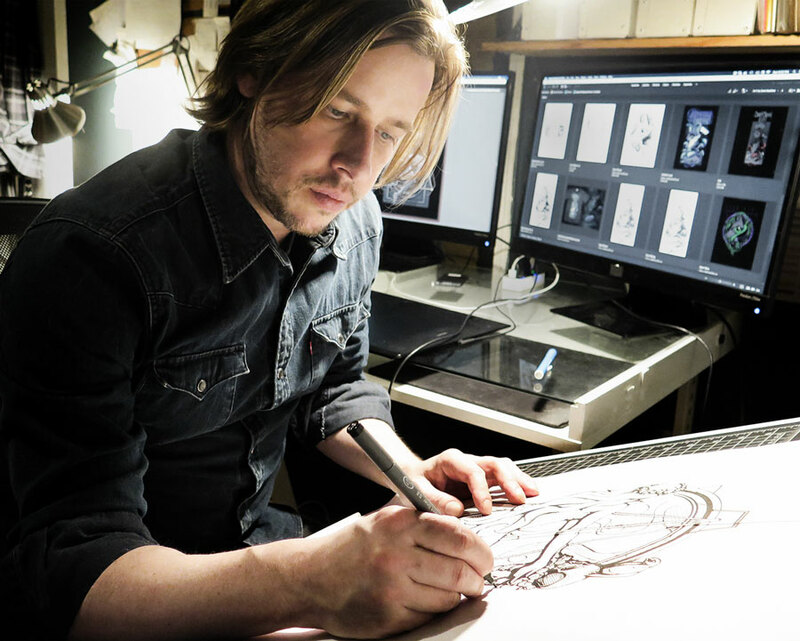 However, in the near future I will be providing an in-depth look on the techniques and software I use. It’s important to understand that in each of these situations the person is interested in different information about your band. Ideally, you would create unique press kits for each of these cases, however I am going to focus on creating a single, well-formatted press kit that can be used for nearly any situation. Note: If possible, you should include a personalized message or cover letter that is directed toward the recipient. 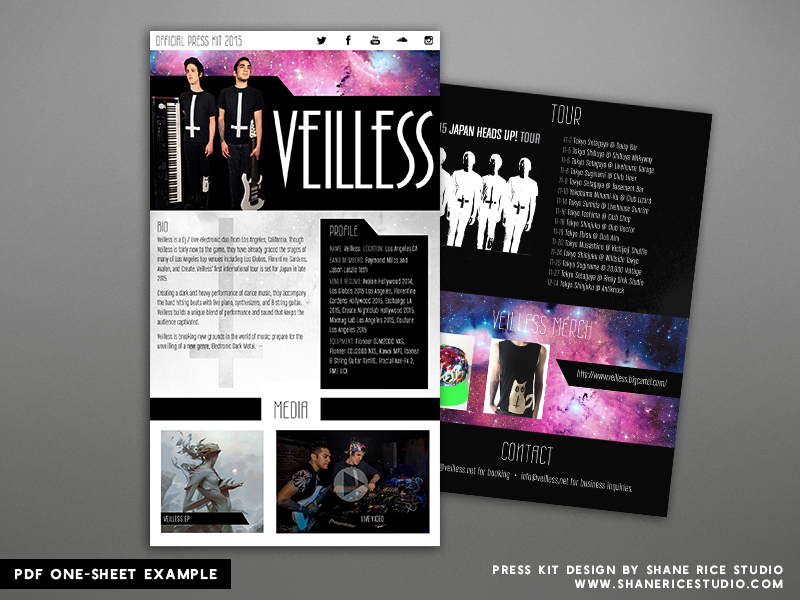 I will stress the importance of a great looking visual design for your press kit, as it not only makes your band look more professional, but also helps it stand out against all the band. If you’re going to ask people to support your band by booking or signing you, then it’s important that you show that you’re invested and take it seriously enough to have a quality design. 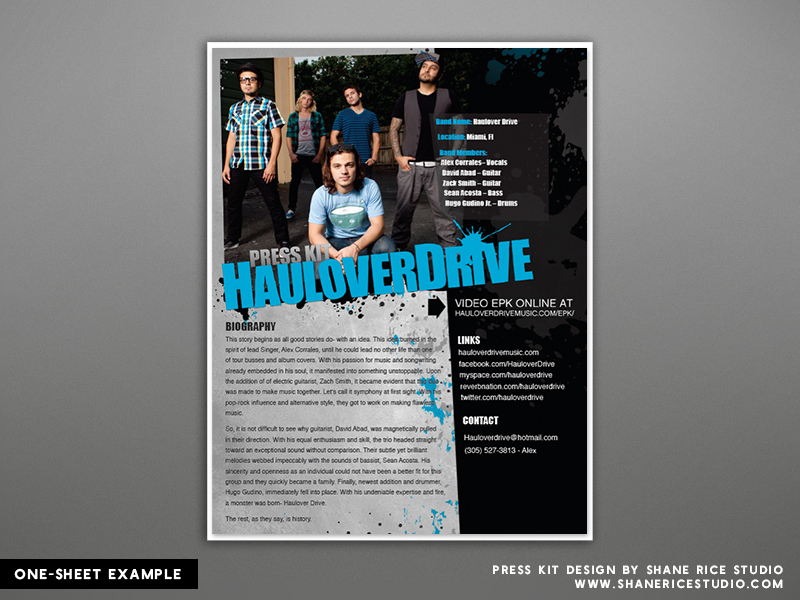 When I see a shoddy looking press kit I just think the band doesn’t really care… so why should I? There are a lot of differing opinions out there on whether or not a printed press kit is useful. Although a PDF file (or an online press kit) is going to be the most practical, I still think that physical printing can be useful. 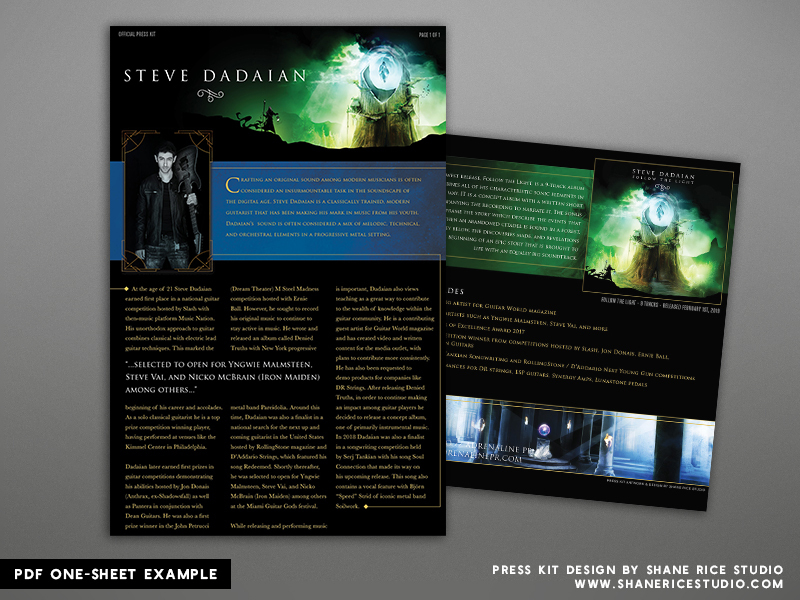 Getting a well made (and great looking) physical press kit in someones hand makes a huge impact. I recommend starting with a PDF one-sheet that is intended to be electronically delivered (via email or download), but that is formatted to a standard paper size (LETTER or A4 depending on your region) so that it can be easily printed if necessary. 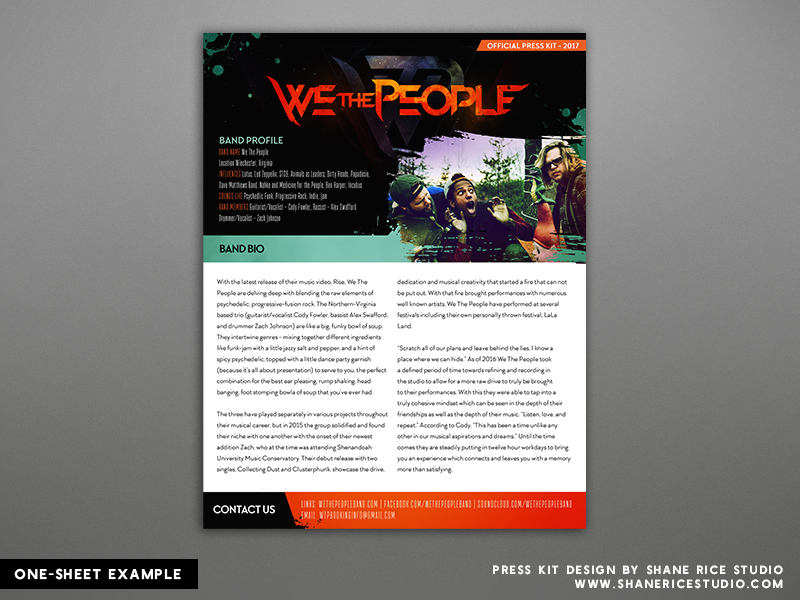 A one-sheet is a press document that condenses all the relevant information into a single page. However, there are many situations where it’s just not possible to fit everything on one page, so a multi-page format is necessary. I think it’s important to have an online press kit hosted on the web. This allows you to link to it via your printed/PDF version, as well as being able to direct users to it with just a single link. Most of the online press kits I have created are password protected, as they contain content that is for press only such as MP3 files, logo files, artwork, and other content that you that you would not to give fans free access to. There are several free EPK services available, and they work well for DIY bands who are on a budget, but I recommend having a custom EPK created whenever possible. I get a lot of clients inquiring about creating pocket folders, and sometimes this is the right way to go. Pocket folders are absolutely stunning and they make it easy to interchange the contents depending on the situation. They also are great for adding extra items such as news clippings, show fliers, stickers, usb sticks, CD’s etc. However, pocket folders are expensive to produce. I recommend this approach only if you have a large printing budget and preferably a professional graphic designer to create the layout. Example: Pocket folders are not cheap to print, but it’s usually worth it. If you want to get noticed this is the way to go. The One-sheet You want to deliver important information about your band in a concise and easy to read way. People don’t have time to read through paragraphs of text and comb through your web site. For this reason I recommend approaching the press kit like a resume, where all the important info is listed separately and succinctly. Band Profile: Band Name, location, members, genre, and social/web links. Notable Achievements: Press quotes, recordings, awards, high-profile shows, etc. This section will obviously vary a lot depending on how long your band has been together, etc. I recommend keeping it fairly short and to the point. Try to avoid too much information about how the band met or other projects that the members were involved in unless it is a particularly interesting story… or the band members are from well known bands. Focus on expressing your band’s message, goals, and vision for the project. I big problem I see in a lot of bios is that they are WAY too long, and they ramble on and on about how the the band met. It’s just not that interesting. Try to focus on quotable text that can be easily used by bloggers, radio stations, and venues to promote. I also recommend putting important names and events in bold text so that they stand out. How many people come to see you at your live shows? What is the press/media saying about your band? How many songs/albums have you sold? Where is your music being played? Is it on any radio stations? Are you an any charts local or otherwise? Have you one any contests or received recognition from an official source? Have you opened for any big bands or played any high-profile shows? Have you worked with any famous producers or recording studios? Make sure you include a photo, even if the band members aren’t current. 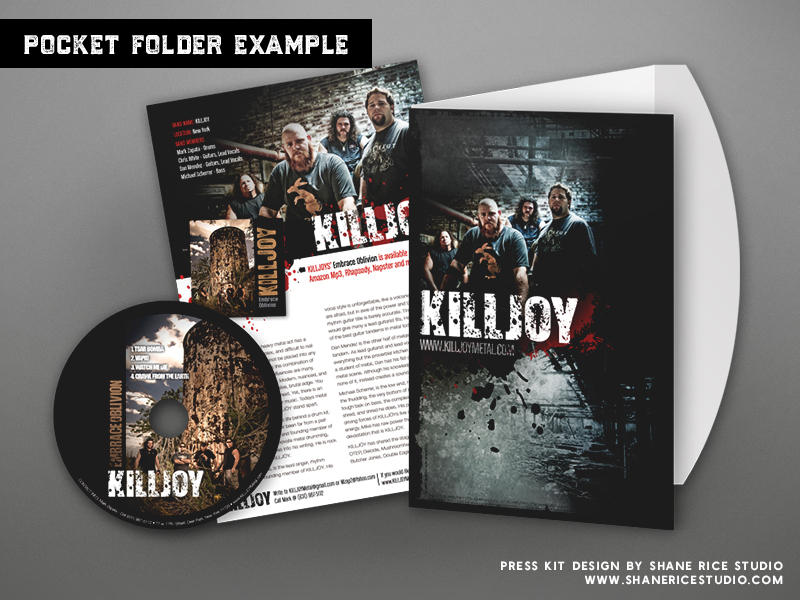 Press kits without photos can be a red-flag and may not be taken seriously. A small photo embedded in the design is perfectly fine. It best to only include 2-3 of your best songs in the press kit. If you’re linking to your music online, then it recommend direct links to each track. This may seem obvious, but honestly it’s the most overlooked piece of information when I’m designing a band’s press kit. Not sure why this is, but make sure that you put the contact info on your press kit. It may be a band member or your booking agent/manager. Don’t put more than one person as your official contact; if you have more than one contact, then create separate press kits for each. If you don’t have one, purchase a domain name for your band so that you can use an official email address such as ‘info@bandname.com’ as it will look more professional. Note: You can purchase domain name and tie it to your email without having an official website. If you don’t have a web site yet, you can also redirect your domain to your facebook, instagram, etc. 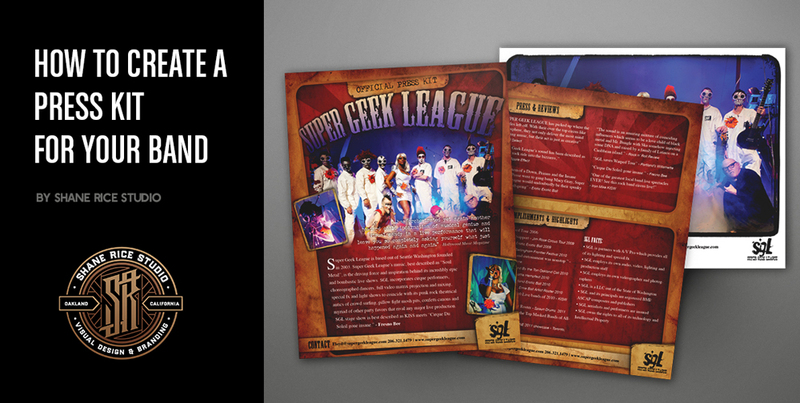 Need help with your press kit design? I’m happy to help! Visit www.shanericestudio.com for more information. Next > Welcome to my new Blog!